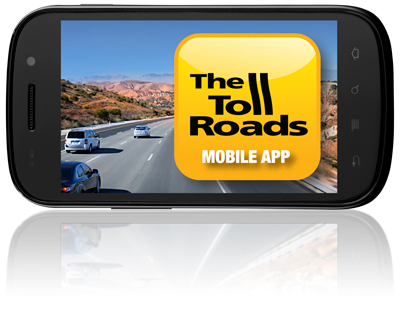 The Toll Roads’ popular app has reached more than 112,000 downloads, allowing customers to open new accounts and manage existing accounts with ease and convenience using their mobile device. In May, the entire Toll Roads network (State Routes 73, 133, 241 and 261) will end cash toll collection, so customers who drive on the roads will never have to stop and pay their tolls. All tolls will be paid electronically through five different options: 1) a FasTrak® account 2) one of three new ExpressAccount™ types or 3) the One-Time-Toll™ option, which does not require the driver to have an account and is designed for infrequent users and visitors. “With the removal of cash, The Toll Roads’ app is a convenient way for customers to manage their accounts and pay tolls from wherever they are,” said Lisa Telles, chief communications officer at The Toll Roads. Originally released in May 2012 (version 2.0 was released in February), the app is available for download by accessing the Apple App Store or Google Play Store from a device and, then, typing in “FasTrak” or “The Toll Roads” in the search function. The app allows users to sign up for FasTrak or an ExpressAccount or pay a toll using the One-Time-Toll option within 48 hours after their trip on The Toll Roads. 350 people used the One-Time-Toll feature. For more information about the different account options, please visit thetollroads.com. An ExpressAccount can only be used on The Toll Roads (SRs 73, 133, 241 and 261) and the toll is, on average, 20 percent higher than the toll paid by a FasTrak customer. Posted on March 19, 2014, in Uncategorized and tagged AET, all electronic tolling, App, ExpressAccount, ExpressAccounts, FasTrak, One-Time-Toll, Orange County, Orange County California, Orange County Mobility, Southern California, Southern California Mobility, TCA, The Toll Roads, The Toll Roads App, Transportation Corridor Agencies. Bookmark the permalink. Leave a comment.